Having years of experience in domain, we are engaged in offering huge collection of Granite Palisade. Our product is highly recommended amongst the customers for their attractiveness. The ordered product enhances the look of the place. Customers prefer us for offering different sizes of Granite Palisade. 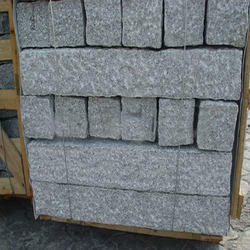 Indian landscape stone is the finest quality product that is popular for strength, beauty and application. This stone has multi use and it can be used for exteriors as well as interiors. Landscape is considered to be perfect in natural as well as finished form. A palisade is a wooden or stone fence or wall of variable height, used as a defensive structure. Often, a palisade would be constructed around a landscape as an astounding fencing. Typical construction consists of small or midsized blocks of stones aligned vertically, with no spacing in between. The height of a palisade can range from a few feet or more to nearly six feet. Stone palisades can be used to make a fence in the garden or in the farm. It looks very attractive and natural. We have palisades in many sizes and thickness and also available in many colors like Mint, Modak, Autumn Grey, autumn brown, raj green, buff, also in black limestone " kudappah black ". Our Stone Palisades are processed to exhibit high level of strength. Since these Stone Palisades are manufactured using the best-grade stones, they are the class apart from others. Our Stone Palisades are remarkable in terms of their cutting, calibrating and edging. Their rough surfaces ensure a realistic appearance. We make our Stone Palisades available at competitive prices.